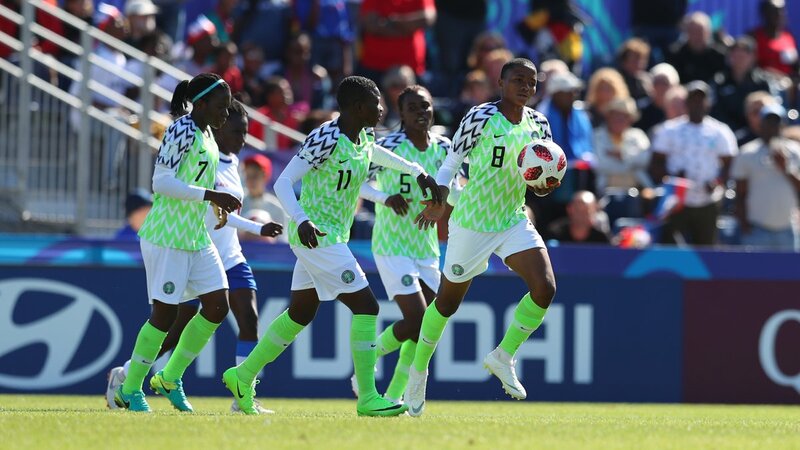 An own goal in stoppage time by China PR, gave Nigeria a highly-dramatic 1-1 draw in Dinan-Lehon, with the West Africans claiming a spot in the quarter-finals from Group D at the FIFA U-20 Women’s World Cup France 2018. Needing a victory to leapfrog the Nigerians to the runners-up spot in the group, China was the more dangerous side in the first half at the Stade du Clos Gastel. Mengyu Shen had the first chance of the match on 25 minutes when she hit the Nigeria crossbar. A few minutes later, Captain Linlin Wang headed over the target from close range. The Super Falconets pushed hard in search of an equaliser in the second half but found the China backline and goalkeeper Huan Xu in resilient form until the end of the contest. With seconds left to play, substitute Aishat Bello’s byline cross from the right saw captain Rasheedat Ajibade challenge for the ball with China right-back Jiaxing Dou. Bello’s cross struck the Chinese defender before nestling in the back of the net and sparking emotional celebrations from the West Africans at the full-time whistle.